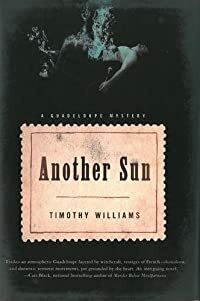 Another Sun by Timothy Williams, a Mysterious Review. Review: Anne Marie Laveaud, le juge d'instruction on the French island of Guadaloupe in the Caribbean in Fall 1980, is investigating the murder of a wealthy landowner, Raymond Calais, who was found shot to death in a pond on his property. It is her responsibility to determine if there is sufficient evidence to bring the prime suspect of the crime — Hégésippe Bray, an elderly man who has spent much of his life in a brutual prison on French Guyana — to trial. Bray had accused Calais in public for stealing his land while he was in prison, and promised to exact revenge, but madame le juge cannot believe he was capable of carrying out his threat, in Another Sun, a stand-alone murder mystery by Timothy Williams. Anne Marie's case is complicated by several factors: she's a white woman on an island populated by largely non-white people during an era of considerable racial inequality; she's enforcing French law on an island, which the many locals believe should independent of France and therefore subject to its own laws, not those of its occupier; her "client" is a black man, who refuses to cooperate with or even speak to a woman, let alone a white woman, and the victim is a rich white man. Just when she believes she has enough evidence to free Bray, he apparently commits suicide in his prison cell. Case closed to Anne Marie's superiors, the local police, even the victim's family. Except it is not a closed case for Anne Marie, who believes that a killer is literally getting away with murder. Written in short, to-the-point style chapters, Another Sun is a complicated novel. Not so much from a murder mystery perspective; it's a little disappointing, for example, that Anne Marie, once she decides that Hégésippe Bray did not murder Raymond Calais, doesn't turn her full attention on the obvious, and really only other, suspect in the case. Rather, the politics of the situation — and of the island in general — dominate the narrative. For those readers not necessarily interested in what essentially passes for the a history of colonialization of the Americas and its current state, at least as of 1980 in Guadaloupe, this can be a wearying story. The frequent, and not so subtle, racial slurs that go in both directions, while no doubt typical of the island and the era, also get a bit tiresome. There are a number of subplots that gamely attempt to divert one's attention elsewhere, but don't quite achieve their objective. And then there's the abrupt, and decidely odd, ending, which paradoxically brings to a close Anne Marie's murder investigation without actually closing it. There's clearly more to the story here, but it seems incredibly unlikely that a sequel is forthcoming. Acknowledgment: Soho Press provided an ARC of Another Sun for this review.